We are just around the corner from the holidays…. Thanksgiving, Christmas, Hanukah, New Years – they are coming. Many job seekers believe that the holidays are a terrible time to job search. Why? They feel that people are too busy with the festivities or are away on vacation or maybe just checked out with the end of year near. At this time of year there are year-end, Christmas and other holiday events happening everywhere. If you don’t belong to a networking group now is a great time to join one or attend an event. Don’t know where to start? 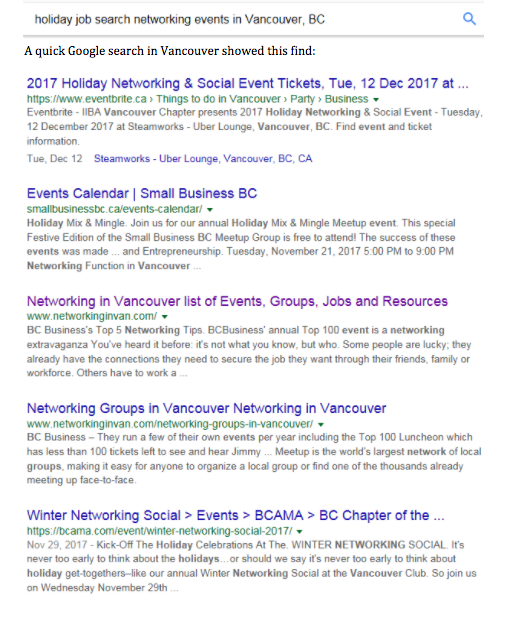 Try Googling networking events + your location + holidays and see what is available in your area. Do you belong to an association? This time of year many associations have networking events or socials you might attend. Don’t belong to an association? Short on cash? Often organizations/associations/network groups will allow you to attend as a guest before joining, sometimes for a reduced rate or even for free. Try volunteering. This time of year there are lots of volunteer opportunities. Give back and watch what comes to you. Holiday parties are another great place to network – whether they are your company parties (if you are employed) or parties you attend with friends/family. I’m a ______________ looking for opportunities in ______________. I’m particularly interested in ________________ or _________________ (companies/organizations). Would you know any places I could look or people I could talk to? It’s not all about you. Have a few questions you can ask other people, listen and be genuinely interested and helpful. People like talking about themselves so being curious and asking them questions can lead to great connections down the road. Make sure you have business cards on hand and don’t just keep them stuffed in your pocket – hand them out. Ask for other people’s cards and remember to follow up with them later. ‘Tis the season to get dressed up to the nines… but, when it comes to professional holiday networking events, you want to keep it tasteful. Avoid denim and too much cologne/perfume. Even if you don’t feel like smiling, try it. Bring on the positive energy and watch what happens! People are attracted to positivity. And now is a great time (and excuse) to wish someone a Happy Thanksgiving, Merry Christmas or Happy Holidays, and reconnect with your past colleagues, friends and contacts. There’s something about the holidays that can bring out the best in people. Make those cold calls, be brave and connect. This time of year I’ve found people are more receptive to meeting with you. Now’s the time to schedule those informational interviews. Often companies that are nearing year-end have money left in their budgets to spend. What does that mean to a jobseeker? You might be able to get your foot in the door on a short contract. Contracts allow you and the employer to see if you are a good fit for the company. It gives you a sense of how the company operates and provides valuable experience. Companies want to spend their budgets or they may lose this money. Now may be the time they add that new position they have been longing to do. Don’t put you’re your job search on hold just because it is the holiday season. Job search and the spirit of the season…they can go together. In fact, this may be the BEST time of the year to job search. Now what strategies will you apply? Thanks for the link to my Elevator Pitch blog!